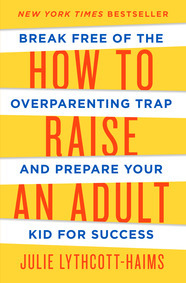 Julie Lythcott-Haims is the author of the New York Times best-selling book How to Raise an Adult: Break Free of the Overparenting Trap and Prepare Your Kid for Success (2015) and Real American: A Memoir (2017). She is deeply interested in what prevents people from living meaningful, fulfilling lives. How to Raise an Adult emerged from Julie’s decade as Stanford University’s Dean of Freshmen, where she was known for her fierce advocacy for young adults and her fierce critique of the growing trend of parental involvement in the day-to-day lives of college students. She received the university’s Lloyd W. Dinkelspiel Award for creating “the” atmosphere that defines the undergraduate experience, and toward the end of her tenure as dean she began speaking and writing widely on the harm of helicopter parenting. How to Raise an Adult has been published in over two dozen countries and gave rise to a TED talk that became one of the top TED Talks of 2016 with over four million views, and counting, as well as a sequel which will be out in 2020. Julie Lythcott-Haims received her bachelors degree at Stanford University, her law degree at Harvard Law School, and her MFA in writing from the California College of the Arts. She lives in Silicon Valley with her partner of thirty years, their two teenagers, and her mother. You can follow her on Facebook and Twitter. Real American Julie Lythcott-Haims came up through brand name schools and entered the corporate world, all the while feeling a desperate need to prove that as a Black woman she had what it would take to succeed. In this moving and insightful talk, Julie turns her journey from self loathing to self love into practical recommendations about how to create an environment in which all humans can thrive. Her candid and incisive commentary on our broken system opens hearts and inspires action. How to Raise an Adult Based on her New York Times bestselling book by the same name, in this talk Julie draws on her own insights as a mother and as a student dean to highlight the ways in which overparenting harms children, their stressed-out parents, and society at large. While empathizing with the parental hopes and, especially, fears that lead to overhelping, Julie inspires audiences to examine their behaviors and join the growing movement to allow children to develop the resourcefulness, resilience, and inner determination necessary for success. Throw Out the Checklisted Childhood The prime audience for this talk is teenagers and young adults living in environments where grades and scores and other external measures of achievement appear to be the primary measure of a human’s worth. Julie takes her audience through an alternative set of goals – be kind; try hard; learn to think and do for yourself; have a wider mindset about colleges; and study what you love – that lead to true success. Want to Succeed in Life and the Workplace? Become Your Self Julie began her career as a litigator in Silicon Valley. She then became a Stanford dean, and now she’s a writer. From her own life trajectory and from working with tens of thousands of our nations best and brightest young adults, Julie has a clear sense of how we become the humans we want to be, and of what gets in our way. Julie’s style of storytelling moves people. They feel she “gets” them. They laugh, they contemplate, and sometimes they even get emotional. After the talk they're motivated to invest in their own growth and development. Parent Toolkit interviewed Julie Lythcott-Haims on tips to guide your child to choosing the right college without overstepping. Julie Lythcott-Haims speaks with MPR News on the college admissions scandal. How do you avoid helicopter-parenting? Listen to the podcast with Julie Lythcott-Haims on WGN Radio. Julie on the dangers of over-parenting for Time, the Washington Post, Los Angeles Times, PBS, the Daily Mail, and Forbes. "[Julie] is a phenomenal speaker, and such a lovely person. Her talk was so well received (standing ovation! ), and she was so kind to everyone who wanted to talk to her." "One word sums it up: WOW! Julie was just terrific. Her very personal and powerful presentation just added to the energy and power generated by the opening session. She could not have been more gracious in her interactions with all of our students. We are just thrilled that Julie could join us." "We had a PHENOMENAL visit with Julie. Every moment she spent on campus with our community members was filled with love, energy and authenticity. I was thanked a million times over for bringing Julie to campus from students, faculty, staff, and parents alike. She had us laughing and crying alongside her. Meeting Julie and having the privilege to spend not just one, but two days with her has been a professional highlight over my 27 years at Andover." "She was one of the best speakers we have ever heard and her message was just right at just the right time. This was a 'nail on the head' kind of experience for us. She encouraged us to let go, to broaden our view of pathways our students might walk post-high school, and to continue to confirm their worth to us as humans regardless of a GPA, a test score, or any other performance. We were inspired and uplifted and we cannot wait to start living out some of her suggestions." "Three standing ovations in three days from three different groups of stakeholders is a pretty good record. Her messages about the dangers of overparenting - with the millennial generation being overprotected, overly directed and over handled - were relevant and thought-provoking." "Julie was absolutely amazing. We were inspired and excited. We’ve never had a better speaker; it was exactly the message our parents needed to hear." "Julie's visit was fantastic. Her presentation to the parents was wonderful as was her talk with the Upper School students. As Julie may attest, our families are in the thick of wrapping their heads around all that it means to be a teenager and a parent in this time of the college admissions "arms race" and many were so grateful that Julie is approaching this all-important topic head on." "We found Julie's topic and presentation to be extremely compelling. With over 900 people in attendance, it would be easy for a parent to feel like one of the masses. However, Julie has a wonderful way of presenting this vital information as if you are two parents talking about your kids over coffee. The book is well researched, timely and helpful. It is incredibly reassuring to know that Julie is a parent of teens - just like us - and searching for ways to raise healthy, happy children. We would highly recommend her to other organizations!" "Standing room only. Record number of books sold. Parents lives changed. Our district has hosted dozens of speakers over the years. Julie's talk is by far the most relevant, timely, and powerful of all we have offered. Her style is honest, funny, and heartwarming. She is someone to whom all parents can relate and her content is second-to-none. I can't recommend Julie highly enough. I wish we could all have little 'pocket Julie's' to carry with us, daily offering us wisdom and advice as we attempt to do the hardest job in the world--raising happy and healthy kids." "Our event with Julie Lythcott-Haims was a smash hit. She was just delightful, wise and really drove home a message with our community that was well-received." "Julie was very well received by students, faculty, staff and parents! She is down to earth, and speaks from heart with amazing insight and the studies to back up her findings. Her presentation has started a school-wide conversation, that is building on other work the school is already doing. We are so very glad we invited Julie to speak."